Perhaps a new Nike campaign could change that. In support of its new street soccer shoes, the FC247 line, the global giant launched a program in Spain this summer that allows players to request a "field" on a flat, open surface in certain neighborhoods. The "field" then is created by laser beams emanating from a device atop a mobile crane. No word yet on whether the program – called Mi Pista, or "My Track" – will expand to the U.S. and Wisconsin, but if it does, I'm pretty sure it would be one of my favorite apps. So what do you think? 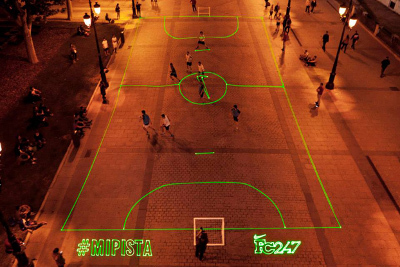 Would you be inclined to play street soccer if Nike's Mi Pista program expanded to the U.S.? Or are you just not interested in that form of the sport? Log in and kick it around in the comments below.